The legend and the facts about this relic are interesting to sort out. It was nicknamed as many times as it was transported from one place to another. Lagoda Press after the ship that brought it from Hawaii to Monterey (Hoyt: 201). The Zamorano Press for the Spaniard-Mexican printer, Augustin V. Zamorano, who purchased it.  The California Ramage, Mexican War Press, Old Monterey Press, Old Monterey War Press, and other variations of these names by different authors. Record's show that on May 20th 1833 the Ramage was purchased by a ship's purchasing agent (Captain Thomas Shaw of the Pocahontas) in Boston for a missionary group in Honolulu, Sandwich Islands. It was already a used and worn press when it arrived. It did have some type that had been produced by the Boston Type and Stereotype Foundry. (Bretnor forward in Kemble:15). 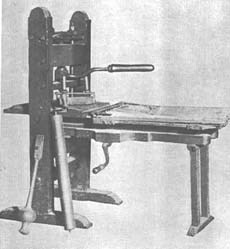 The Hawaiian paper had already bought another press and so sold the Ramage press to the government of California. The gold rush halted these papers for many weeks and the Californian didn't start up again until July 15, 1848. (Bretnor forward in Kemble: 28) When the two papers merged, (Star & Californian - soon to be called the Alta California), the Old Press was sent to Sacramento. The Ramage was shipped in 1849 to the new town of Sacramento City aboard the sailing ship Dice mi Nana. Off loaded at Webster, below Sutterville and carried overland to Sutter's Fort. A makeshift newspaper office was set up in an open roofed adobe, located outside the walls of the fort. 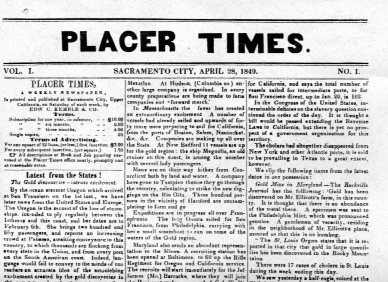 The first issue of the Placer Times appeared April 28, 1849. It measured 13x18 inches. "bearing a crude heading carved with a jack knife from a handy piece of wood." (Kemble: 137) The editor was Edward C. Kemble. Fact is he did the whole thing alone. 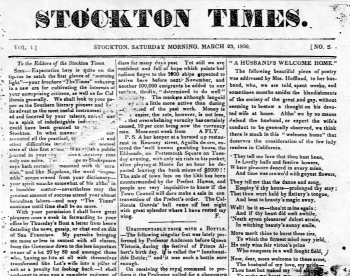 In July 1849 the press went to the City Hotel, Sacramento City. It made another move within the city. Gore couldn't pay the balance of $360 for the press and a sheriff's sale gave it back to Gunn, November 12, 1851. The press had then been disassembled for transport and the largest part left on the porch, over night. This portion had been dragged into the street that night by unknown vandals and set on fire. The damage was minimal and it survived its second attempt on its old structure. 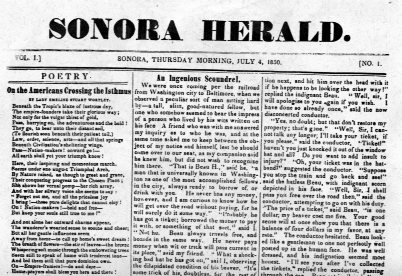 The Sonora Herald printed a nasty story about the total destruction of the press while the citizens of Columbia cheered. The reality was that it eventually went back to Sonora. Goodman III, John B., "The Sacramento Placer Times 1849-1851," 1949. Hall, Mark W., "Journalism in California, the Pioneer Period, 1831-1849." Kemble, Edward C., "A History of California Newspapers, 1846-1858"
Christman, Enos & Florence Morrow, "One Man's Gold: The Letters and Journal of a Forty Niner." Also, many thanks to the help and research of Mary Helmich and her brother.